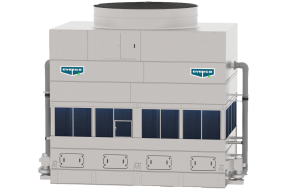 Meet EVAPCO’s ESW4 Closed Circuit Cooler, their largest and most energy efficient single cell evaporative cooler. The new 14’ x 22’ ESW4 was designed to maximize capacity and optimize energy efficiency in EVAPCO’s single largest closed circuit cooler cell available. Utilizing EVAPCO’s Crosscool Internal Tube Enhancement and the patented elliptical tube Sensi-Coil Technology, the 14’ x 22’ ESW4 provides equal or greater capacity than competitive units that are larger in footprint and higher in fan motor HP. The optimized ESW4 was developed specifically for high tonnage applications such as data centers, industrial plants, and large HVAC applications, where the end user requires the lowest energy consumption on the fewest amount of units, connections and fans. The ESW4 offers the most models and box sizes in the industry and is designed with IBC Compliant Construction, FM Approved Construction and CTI Certified Performance. Read more about the ESW4’s Principle of Operation, Product Features, and Equipment Upgrades here. Want to discuss this product for your project? Email us at sales@michiganair.com.